Check out the events section in Team Unify and "edit commitment" for meets that your swimmer qualifies for! Choose individual races, indicate special needs through the events portal. Make sure to "save changes" on your meet sign up!! Coaches with then go through the races you signed up for and can approve and/or add more events at their discretion. Use the "Job Sign Up" tab to sign up for timing seats, etc. You will be billed directly through TU and emailed by your coach when you're swimmers' entries are approved. Organized by A/B/C levels, with A being at the top. All time standards are posted on the San Diego Swimming website! As swimmers go to more meets, they are given the opportunity to achieve higher standards. Go beyond A times (JO Qualifications, Zones/Far Westerns, etc). Meets can be combined (A/B, B/C, A/B/C meets). Coaches have the discretion of signing swimmers up for meets above their qualifications in specific cases - contact us! I'm qualified and signed up, now what? Meet information, including timelines, heat sheets (if available), venue info, etc, is always sent out before the start of the meet via email. Swimmers ALWAYS check in and out with their coaches before races. We encourage the swimmers to come up to us on their own, without parents. Parents can stand outside the tarps. DO NOT try to talk to the officials, they are busy. If you have questions or concerns, come directly to us and we will try to settle the matter. Directly approaching an official could result in removal from the deck. 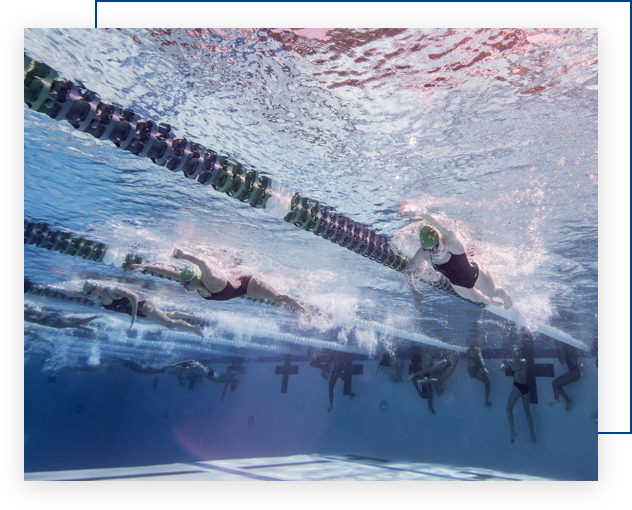 As per USA Swimming, there is NO photography behind the blocks/starting area. Swimmers race hard and HAVE FUN!